SOGEMI 1968 - 2018: 50 years of experimentation, innovation, planning and manufacturing of machines and plants for foundries. In 2018 Sogemi celebrates "its first 50 years". Born of its founder Angelo Vigorelli's vision, this company has grown in these many years thanks to forward-looking intuitions on designing and manufacturing machines and plants for foundries that use chemically bonded sands, becoming now a national and international leader on its sector. The ability of its founder to create a united and loyal staff made Sogemi a second family to all its employees, as is demonstrated by the fact that many of them have been part of the team for over 30 years. Today, Sogemi has a solid team composed by employees with a high technical-cultural level, about 70% of them has a university education with a prevalence of graduation in engineering. Always attentive to the development of new technologies, with a particular care towards the reclamation and recycling of materials with a view to costs reduction, and attention to environmental problems, Sogemi can boast numerous realizations and several successes exactly on the basis of these principles. Sogemi is present on 32 worldwide markets with its operative installations. The elements that carried Sogemi to these results have been: an in-depth knowledge of the problems concerning the reclamation and the thermal regeneration of foundry sands; a huge experience in designing and manufacturing No-Bake moulding lines; a consolidated knowledge of melting processes through oxi-combustion rotary furnaces; a large use of cutting-edge technologies; the efficiency and reliability of the plants; a competent and qualified technical consultancy; an efficient service of post-sales assistance. We want to thank our loyal clients who always confirmed us their trust in us during all these years, and the precious suppliers that cooperate with us for the development and the perfectioning of our production. 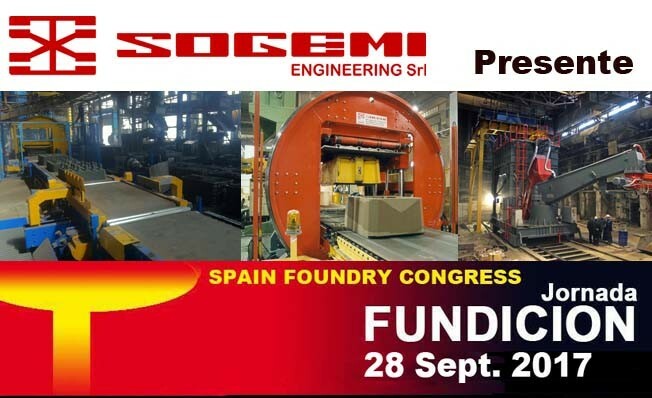 Sogemi will be present at the next Spain Foundry Congress in Bilbao (September 28th, 2017) introducing a paper on chemically bonded sand thermal regeneration; don’t miss it! 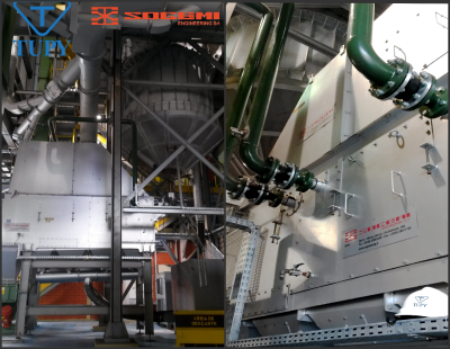 In August 2016, together with Funditec, its partner for Spanish market, Sogemi successfully commissioned an articulated mixer with double mixing arm for Alkaline-Phenolic process. The mixer was supplied to Suner Foundry in Spain, near Barcelona. The mixer is equipped with a double mixing arm: the first one has an output of 15 t/h and blends silica as backing sand with additives , the second one has an output of 3 t/h and blends the chromite with the same chemical process. With this solution, the customer can obtain a perfect blending of the sands with two very different mixing outputs. This is the ultimate solution for those foundries that use, in their molding process chromite as facing sand and silica sand as backing sand. The mixer is also equipped with mass flow meters that check the exact quantity of additives dosed by the pumps, and adjust the pumps speed according to the quantity actually dosed. Like in every Sogemi mixer, also in this one the mixing arms are equipped with additives recirculation system, electro pneumatic gate for the first sand homogenization and cleaning system. The mixing arms’ covers are equipped with wear-resistant protection shells. 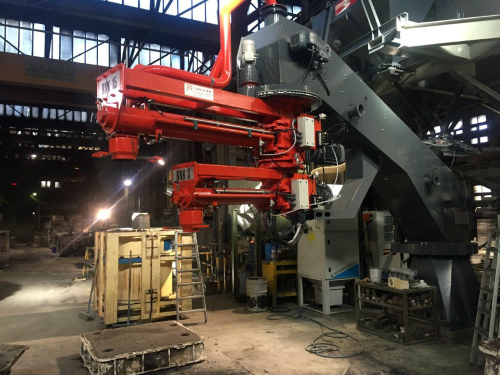 Sogemi Engineering started up, at the end of 2015, one thermal regeneration sand plant Simplex 5000 at the Iron foundry Eisengießerei Torgelow, www.eisengiesserei-torgelow.de, one of the leading foundry in the production of windmill castings, located in Germany – in the east of Mecklenburg Vorpommern. 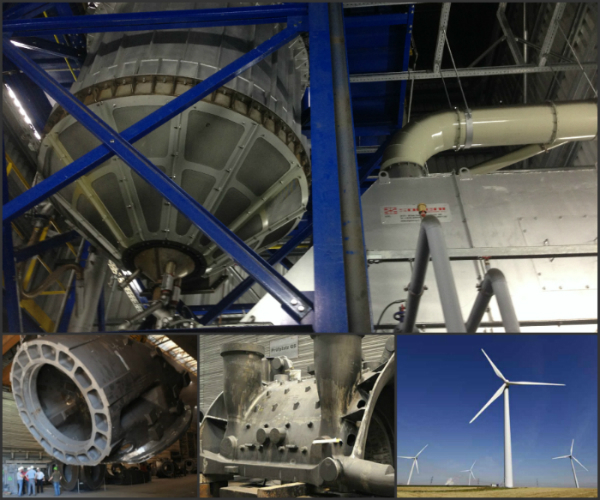 Torgelow produces castings as rotor blades, frames and generator housings for wind power systems. The weight of the castings can reach 100 t.
The target of Torgelow, by installing Sogemi’s thermal regeneration plant, is to avoid buying new sand and at the same time avoid the disposal of used sand, keeping the loss of Ignition of the sand under control. Sogemi thermal regeneration Simplex 5000, has an output of 6 t/h and matches perfectly these needs. 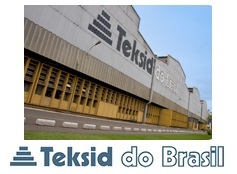 Working 24 h/day the plant regenerates 144 t/day and reduces the LOI at less than 0,1 %. Considering that Torgelow uses ~ 1000 t/day of sand in his moulding, the Simplex regenerates ~ 15 % of the total amount of sand used in the foundry. SOGEMI has been chosen for the second time by Tupy as supplier for a sand thermal regeneration plant. In year 2008 SOGEMI supplied a thermal regeneration plant to Tupy's facility in Mauà and in 2014 another one for its facility in Joinville which has this August 2015 been succesfully started up. Sogemi will attend GIFA 2015 . We will wait you at our booth F18 - HALL 16 in the Italian area .